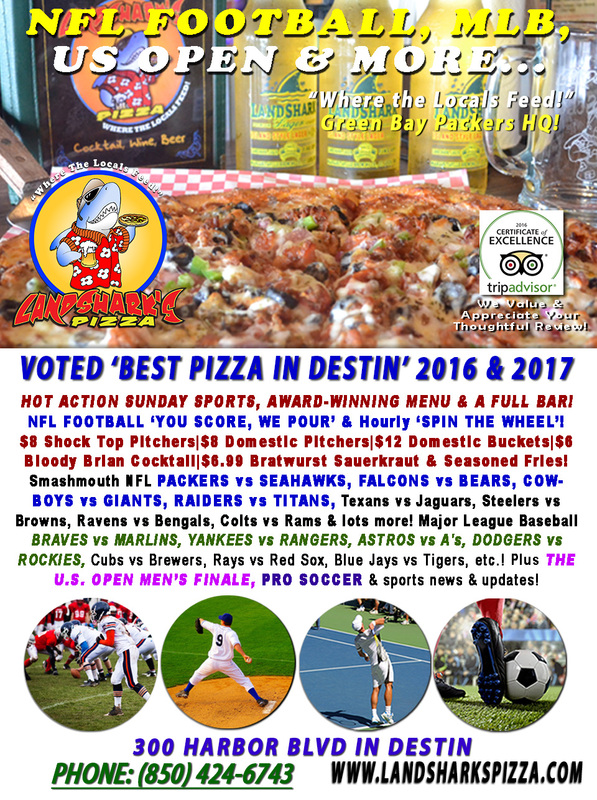 / Best Calzone in Destin FL / Full Force Sunday NFL Football Food & Drink Specials Plus YOU SCORE WE POUR, MLB, US OPEN Finale & more! 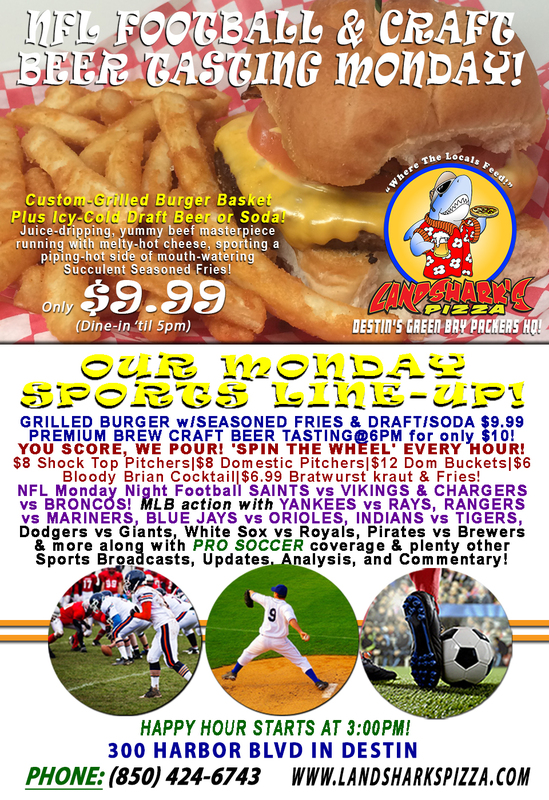 Full Force Sunday NFL Football Food & Drink Specials Plus YOU SCORE WE POUR, MLB, US OPEN Finale & more! 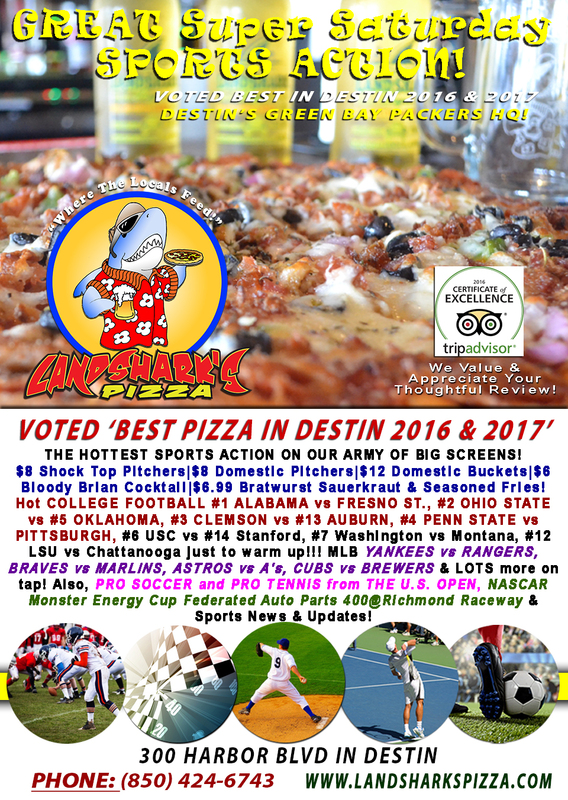 Sunday NFL Football in Destin at Landshark’s – Home of ‘YOU SCORE, WE POUR!’ Wear your favorite team’s jersey and win a FREE BEER POUR with every touchdown! ‘SPIN THE WHEEL’ DEALS Every Hour! Get ready on Action Sunday for smashmouth pigskin, playoffs-panic baseball, US Open Tennis finale and an exciting golf finale at the Dell and the ‘BEST PIZZA IN DESTIN’ (Voted 2016 & 2017! ), a belly-busting menu of delicious eating from Award-Winning Wings, Oven-Baked Subs & Calzones to The Best Traditional BBQ, loads of appetizers, and A FULL BAR! SPORTS ON OUR ARMY OF BIG SCREENS – GREEN BAY PACKERS vs SEATTLE SEAHAWKS, FALCONS vs BEARS, COWBOYS vs GIANTS, RAIDERS vs TITANS, Texans vs Jaguars, Steelers vs Browns, Ravens vs Bengals, Colts vs Rams & lots more! Major League Baseball includes BRAVES vs MARLINS, YANKEES vs RANGERS, ASTROS vs A’s, DODGERS vs ROCKIES, Cubs vs Brewers, Rays vs Red Sox, Blue Jays vs Tigers, etc.! Also, PRO SOCCER and Final Day coverage from THE U.S. OPEN@Flushing Meadows plus plenty of other Sports Broadcasts, Sporting News, Analysis, and Commentary! Previous Post: « Hot COLLEGE FOOTBALL|Alabama, Ohio State, Clemson, Penn St & More, $8 Pitchers|$12 Buckets, NASCAR & MLB!